Rectifying what one organizer called a “historical oversight,” a groundbreaking ceremony for a memorial to honor African-American veterans of Lyon Post No. 31 of the Grand Army of the Republic was held Tuesday at Hagerstown’s Rose Hill Cemetery. The Grand Army of the Republic was a veterans organization for those who battled for the Union during the Civil War. “Hagerstown had two posts of this organization [the Grand Army of the Republic] ... Because Maryland was mostly segregated at the time we had two posts — one for white veterans and one for black veterans,” said local historian Stephen Bockmiller, who also works for Hagerstown city government as a zoning administrator and a development review planner. A memorial — the Reno Post No. 4 memorial — already exists at Rose Hill Cemetery to honor the white veterans. The Lyon Post consisted of African American veterans in the city and county who fought for the Union, and was formed in 1883 and disbanded around 1915. The memorial for veterans of Lyon Post No. 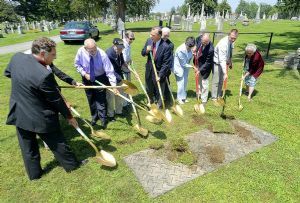 31, which will rise next to the existing memorial at Rose Hill Cemetery on South Potomac Street, is expected to be completed by Sept. 21 — in time for a dedication that will part of a larger event that day to honor Civil War veterans. “The dedication will coincide with the 150th anniversary of the mustering into Union service of the first African-American troops from Maryland,” according to a city news release. Among those who spoke at the brief ceremony Tuesday were city Mayor David Gysberts and Thomas Riford, president and chief executive officer of the Hagerstown-Washington County Convention and Visitors Bureau. Gysberts thanked Bockmiller for devoting his “personal time and energy to the project,” as well as residents and organizations for their generous donations toward the construction of the memorial. He said that the memorial will be 6 feet tall and 4 feet wide, and carry a quote from Frederick Douglass, a well-known abolitionist. The memorial is expected to cost about $4,500, including the value of donated labor, Bockmiller said. Riford said it was important to recognize the sacrifices and contributions of African-American troops during the Civil War. Riford said there was a lot of Civil War history in the county. “We welcome visitors who want to study the Civil War history of Washington County,” he said.